to aid the organization and presentation of my research, notations, and observations regarding the study of American history, in particular the Civil War. This study currently manifests itself in two directions – cataloging of historical markers and site visits to Civil War battlefields. He calls himself a Marker Hunter, and Craig’s a prolific contributor to the growing Historical Marker database (HMdb); he talks about his collection captured on Maryland Heights last Fall in today’s post. 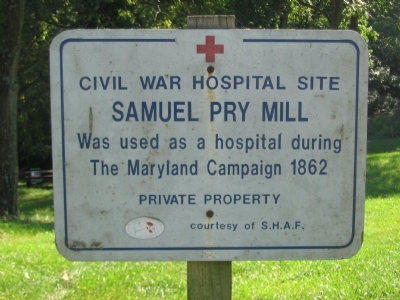 In the previous post he introduced some Maryland campaign hospital markers erected by SHAF that I’d not seen before. Great stuff. Welcome to the ‘sphere and continued good hunting, Craig! but more likely page 140 “As a general rule, the maxim of marching to the sound of the guns is a wise one.” by Baron Antoine H. Jomini 1779-1869, (a member of Marshal Ney’s staff and the author of “Art of War”) This quote is from Precis Politique el Militaire de la Campagne de 1815. As you can see, it is “march” not “ride.” Once again the damn cavalry tries to take credit from the infantry. Brian, thanks for the kind words. I considered naming the site “to the sound of the silent guns…” in reference to the silent sentinels on many battlefields. But feared folks would consider me odd, moronic, or a real estate developer . Hi Craig, you’re welcome. Just keep up the posting!